The Underdogs Nikao Sokattak put on a gusty effort in the feature match of the Van’s premier men’s competition on Saturday against host Tupapa Maraerenga Football Club. But it wasn’t enough as the defending Round Cup Championship winners managed to finish on the top after 3-1 win to remain on track of a successful titile defence. Both teams were determined to win and played a defensive game. With everything on the line, Nikao Sokattak threw their all into the game and in the 12th minute, the visitors were rewarded with a goal as Mark Leito scored for Nikao Sokattak, one goal to nil to lead. Tupapa Maraerenga had several attempts at goal but was unable to convert. The first half ended with a resolute Nikao Sokattak leading one goal to nil against Tupapa Maraerenga. Nikao Sokattak played valiantly in the second half but could not hold back a determined Campbell Best of Tupapa Maraerenga that scored a goal for his team to equalize in the 54th minute, one goal all. Tupapa Maraerenga kept its pace and Campbell Best scored again for his team in the 62nd minute to take the lead two goals to one. The champions were not done and managed to score the third in the 72nd minute through Paavo Mustonen to seal the win three goals to one. The match was exciting and hard fought and ended with Tupapa Mararenga winning with a full time score of three goals to one. 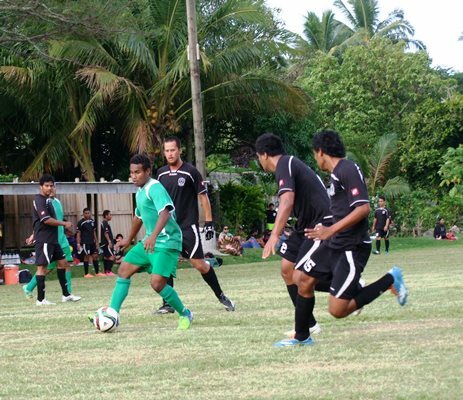 In the other Van’s Premier men’s matches on Friday Puaikura beat Titikaveka FC five goals to three and Takuvaine FC defeated host Avatiu FC four goals to nil. In the Islander Hotel Senior Women’s matches on Saturday, Nikao Sokattak beat Tupapa Maraerenga four goals to three and the CIFA Under 16 Girls thrashed Matavera fifteen goals to nil. Thursday’s Islander Hotel Senior Women’s matches, Puaikura went down to Titikaveka one goal to nil and Avatiu and Takuvaine were evenly matched nil all.